Finnish company Jolla is following through on a promise to add more features to its Linux-based Sailfish OS, with plans to offer more personalization and a feature called “Events” that will show messages, calendar events and other information on the screen at once. Since its inception in 2011, Jolla has bet on the Sailfish OS to differentiate it from the competition on smartphones and now tablets. Android and iOS may dominate the tablet space, but the success of a campaign by Jolla in which it sold 7,200 tablets on the Indiegogo crowdfunding site shows there is an appetite, albeit not very big, for products running other OSes. 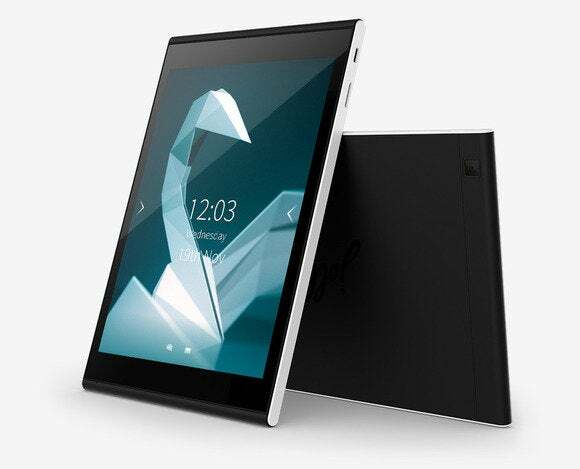 As part of that campaign, Jolla pledged to make improvements to Sailfish 2.0, which will be out in the second quarter of next year, along with the company’s new tablet. A key Sailfish feature aimed at differentiation has been a start page that shows all running apps in a single view, which will be continued in the new version. Because of the limited size of Jolla’s fan base, it’s important for the company to keep users happy. “We have promised to deliver in Q2 2015 and we are very confident we can reach that goal,” said Juhani Lassila, head of communications at Jolla, adding that the company is grateful for the support and the US$1.8 million people have pledged through crowdfunding. Jolla’s crowdfunding campaign got off to a flying start Nov. 19 after it announced the tablet at the Slush conference in Helsinki, passing the original funding goal of $380,000 in just a couple of hours. 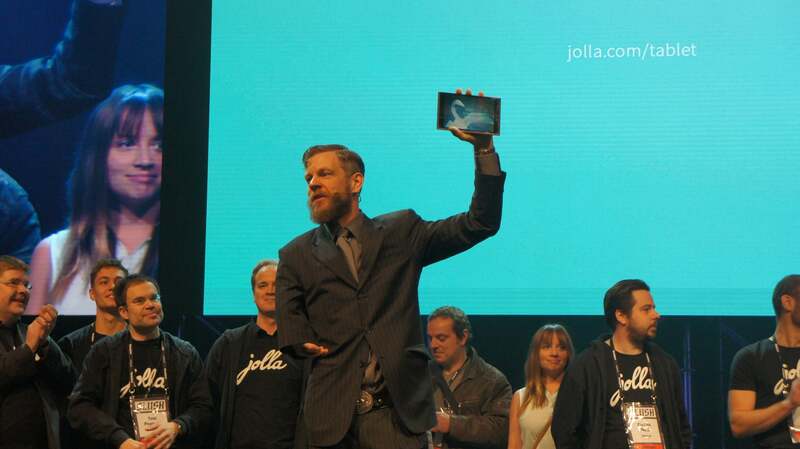 Jolla co-founder Marc Dillon holding the Sailfish tablet aloft during its reveal at SLush 2014. To keep up the momentum, Jolla promised to add more features to its Sailfish OS if additional funding goals were met. So backers will also get a split-screen mode that lets users view and use two apps simultaneously, and the ability to expand the storage capacity with 128GB microSD cards. The Wi-Fi-enabled tablet will have a 7.85-inch screen. The screen will have 2048 by 1536 pixel resolution and a 1.8 GHz quad-core processor from Intel. It will provide 2GB of RAM and 32GB of integrated storage that can be expanded using the microSD card slot. The tablet will sport a 5-megapixel camera on the back and a 2-megapixel front camera. The tablet would have gotten a cellular connection if the campaign had reached $2.5 million. That’s a still possibility, but Jolla can’t promise it, according to Lassila. The company is also adding new product packages, including the ability to get a discount on a tablet and smartphone combo or a discounted smartphone. The discounts were claimed by only 176 users, suggesting that many of the tablet’s backers already had a Jolla smartphone. Getting users to choose something other than Android or iOS tablets on a larger scale has proved difficult. BlackBerry learned that the hard way with the failed PlayBook, and Microsoft’s progress has been slow. For the full year, Android and iOS’s market share is expected to be over 95 percent, according to IDC. Windows will have a 4.6 percent share and other OSes 0.2 percent, it said in a recent report. Jolla’s total revenue made it the sixth most successful technology campaign so far on Indiegogo, beaten by the likes of Canary’s wireless home security device, Jibo’s robot, Skully’s smart helmet and Axent Wear’s headphones with integrated cat-ear-shaped speakers. Backing crowdfunding campaigns isn’t risk-free and funders should always brace for delays and failures. Canary has struggled with both hardware and software delays. It had originally hoped to ship in May, but at the end of November the company said a majority of its backers would have to wait until after the year-end holidays. The largest unsuccessful campaign ever on Indiegogo was Ubuntu’s Edge, which offered users a smartphone and desktop PC in one device. While the campaign collected an impressive $12.8 million, it had a fixed goal of $32 million, so it failed and nothing became of the product. The Jolla tablet should be a safer bet for several reasons. Jolla has architected Sailfish in a way that lets it take advantage of hardware built for Android, which simplifies that side of the product development. Also, the company isn’t writing the software from scratch.